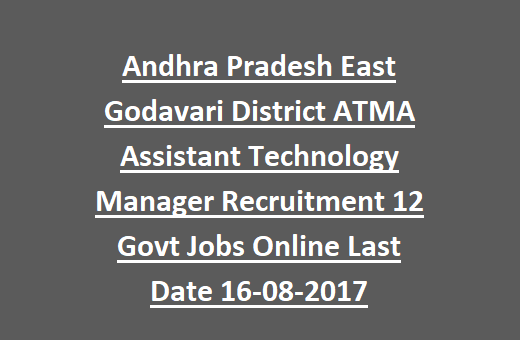 Assistant Technology Manager vacancies under contract based in East Godavari District. Only EG district candidates are allowed to apply for these vacancies. Sufficient educational qualifications having candidates of East Godavari district can submit their applications form online on or before 16-08-2017 by 05:00 PM. Selection process for these vacancies will be held based on merit in higher educational qualifications having candidates. 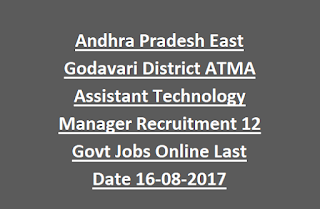 For more details regarding ATMA East Godavari District Asst Technical Manager Jobs see the details given below. There are total 12 vacancies available in this current recruitment of EG ATMA. As on 01-07-2017 candidates age limits are 18-45 years. Up to 31-03-2018 and it will be renewed based on the ATMA Scheme. Preference will be given to the PG/Degree qualified candidates those who are having experience in Computer Usage, Field Work Experience and Area Specialization. Final Decision will be in the hands of District Selection Committee. Eligible candidates can apply online @eastgodavari.nic.in. website. After submission of application online take printout and sign on given box, attach the attested photo on application form in a given space. Attach the all educational qualifications certificates, experience certificates, community certificate, nativity certificate, ID and address proof and if any other related documents and send the filled application form to the below given address to be reachable on or before 16-08-2017 by 05:00 PM.